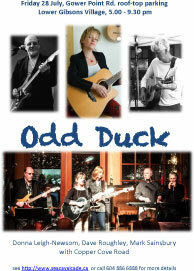 As the name implies, Odd Duck is actually four bands in one! Donna Newsom, Mark Sainsbury, and Dave Roughley are three independent singer-songwriters who have joined together with Copper Cove Road (an established and talented North-Shore four-piece band) to create a musical experience of uncommon diversity. 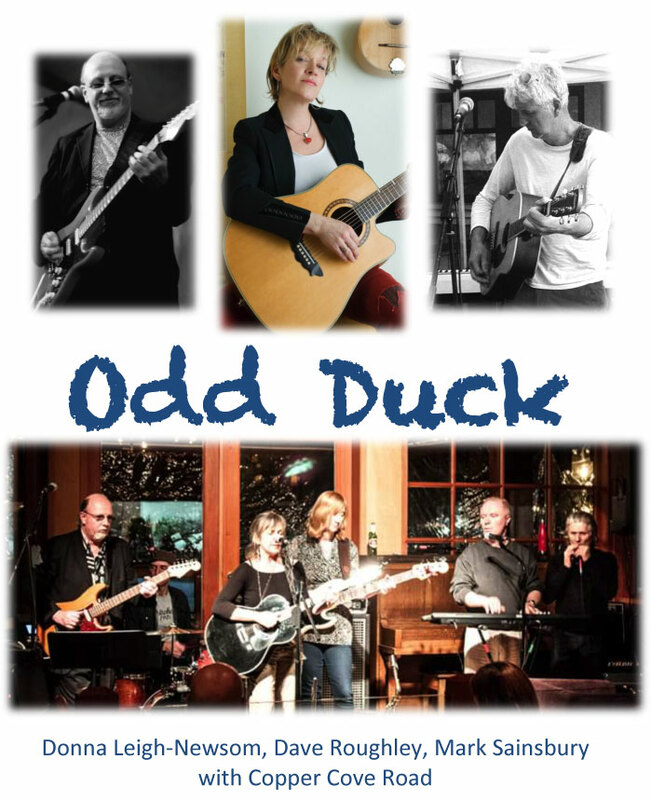 Odd Duck delivers both engaging originals and convincing covers (including Elton John, Fleetwood Mac, The Beatles, Van Morrison, and many others) for all occasions. Contact Dave at 604-886-6888. Etienne Siew is a singer-songwriter who lends his sound to the genres of folk, soul and blues. 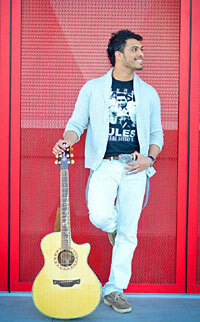 His vocals and guitar melodies are characteristic of the eclectic mix of artists who inspire him. His original pieces have said to encompass the softer soaring vocals of City and Color, the gritty blues of The Black Keys, the story-weaving capabilities of Ray LaMontagne with the profound authentic messages reminiscent of Bob Marley. His current work is heavily inspired by nature and uses imagery to vividly address the themes of vulnerability, love, friendship, adversity, learning and overcoming life’s obstacles. His musical journey has taken him to perform year round at the Hard Rock Casino, to be featured and interviewed as an emerging artist on Shaw TV, and led him to take second place at Coquitlam Idol. Finally he was selected to sing the national anthem and share his original stories as a performer at “The New Citizen’s Reception.” Etienne continues to share his music throughout Vancouver and hopes to one day connect his music to a global audience. My name is Ashley Hautala and I'm 19 years old. Music has been a part of my life since I can remember but I began pursuing my passion when I was 9 and my grandfather gifted his guitar to me. I've had many incredible teachers and encountered countless amazing people along the way that have not only shaped me as a musician but as the person I am today. Since then, every song I've written, every performance on stage and every car ride where I've blasted music and sang in my car has changed me for the better. Although it's a lot of work, the end result of all the practicing and time put in has always been a good one and I hope to continue this journey for the rest of my life. Amy Hef has been compared to artists like Pink, Tegan and Sara and Roxette. Splitting her time between Alberta and LA since 2007 and finding successes along the way as an honor student at Musicians Institute (Hollywood, CA) 90.3 AMP Radio’s Rock Star, a Breakout Artist, winning YYC Music Awards 2017 – Female Artist of the year and George Stroumboulopoulos included her in his list of Top 3 Buzz Bands. Life wasn’t always lived this ‘out loud’ for the now singer/songwriter/recording artist. The youngest of five kids growing up in northern Alberta she barely spoke a word before the age of 11. She had four other siblings who did all the talking for her. Her pre-school teacher hilariously thought she was deaf because she never responded to any of her questions — Amy didn’t realize she was supposed to. Being a bit (understatement) on the chubby side as a kid with little or no confidence she stumbled on No Doubt and Gwen Stefani and their video “Just a Girl” – and everything changed in that moment. Amy knew who and what she wanted to be. 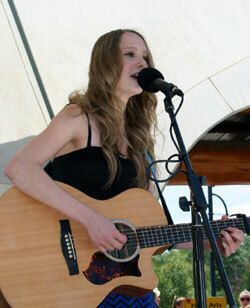 She took up the drums, which lead to the guitar and songwriting. That’s how Amy found her voice and a way to connect with the world. Shedding the weight and finding her music and her voice meant saying goodbye to all those childhood insecurities. This deep love affair with music coupled with her respect for all those who have gone before and those who continue to build her ever-expanding musical knowledge have brought her to this point. With Amy’s natural talent, compassion and sense of humour, this multifaceted artist brings a truly unique, energized and interesting vibe to everything she does. There is a fun, fresh, bright, kind, insightful perspective in every song and every live show. The days of being the extreme introvert are over. Amy found a strong and powerful voice through music – and she’s never looked back. Amy is working and creating again in the studio in LA, Canada and Sweden. Dana Domingo Kinghorn is Directress and Choreographer of the BELA DOMINGO POLYNESIAN DANCERS, a Vancouver based dance group which has been part of the Lower Mainland multicultural performing arts community for almost four decades. Past performances include Cultural festivals in Quebec, Ontario, and British Columbia. Lower Mainland performances include PNE, Canada Day at Canada Place, Kitsilano Showboat, Dragon Boat Festivals, Multicultural Festivals in Langley, Surrey, Burnaby, Richmond, and Vancouver. Sikat-Araw Kultura Filipiniana was initiated by caring, fun-loving, community-loving, like-minded Sunshine Coaster friends that share a love of culture (Sikat-Araw means Sunshine). 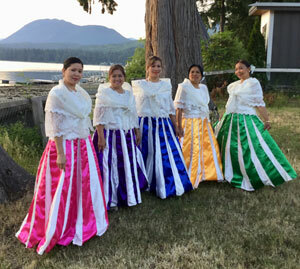 The main goal of the group is to share their unique culture through traditional folk dances, music and/or songs from the Philippines. They also hope to do cultural exchange and learn other traditional dances and songs from other countries. They also like to help promote multiculturalism and diversity on the Sunshine Coast and elsewhere. Founding Members/Performers: Amelia Carlington, Dana Kinghorn, Eva Karapita, Racquel Dacanay, Juvy Serrano. Keia Papa Kaua is a traditional Hawaiian Hula dance group in Gibsons led by Dhyana Bartkow from Inner Moves Wellness Centre. As well as being a dance of beauty and grace, hula is a way of life based on aloha (unconditional love and gratitude) and ohana (family and community). 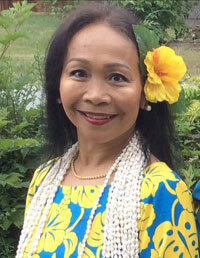 Dhyana has been dancing and training in Kauai with Puna Kalama Dawson, a kumu hula of ancient lineage, since 1999. Dhyana teaches both advanced and beginners hula from her studio in lower Gibsons and will be hosting Puna in November to workshop with her students and give a public performance. Dhyana may be reached at 604-886-9737 or email hula@Innermoves.com if you are interested in lessons or booking a performance. 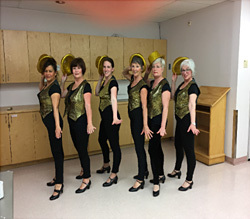 This is a dance program created by Sandra Cordero that runs at the Sechelt Senior Activity Centre. This program aims to teach the basic and intermediate level of all the Latin dances such as: Merengue, Bachata, Mambo, Rumba, Cha cha and Salsa. After each dance period, the students learn and perform a choreography. 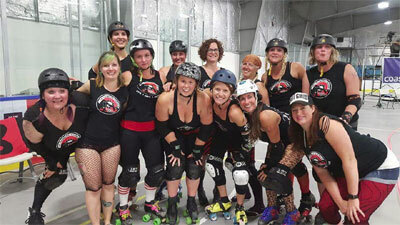 Let's Dance Extended is a group of ladies of all ages who love to put on a show. From Latin American folklore dances to Jazz routines and Broadway pieces, these ladies can do it all. For more information on upcoming programs, private classes and performances, please e-mail Sandra at mequita55@hotmail.com. 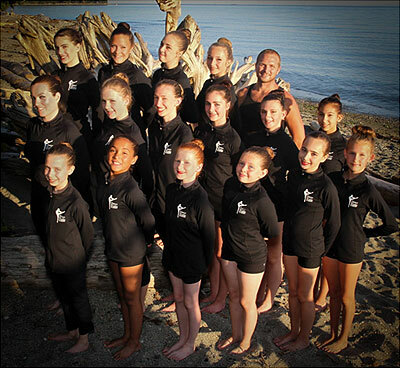 Dance Works Academy was established in Gibsons in 1993, and over the past 20 years has evolved into a full performing arts school. Dance Works Academy presents Spectrum Youth Dance Company consisting of dancers ranging in age from 10–19 years of age. In addition there will be performances by choreographers and members of the Adult Company and Dance Works Jr. Performers. Brian Swanson, keyboard and vocals, started playing in bands at the age of 14. He formed the Penn Kings at 16, released an album (AS We Are) in 1973, toured Canada from 1974-1978, formed Local Traffic in 1985 until 2005. Brian is an avid lover of old cars and is actively involved with the Coasters Car Club. Ken Shearsmith, bass guitar and vocals, started playing at the age of 15 in dance halls in the Fraser Valley. After turning 19 he played throughout BC before coming to the Sunshine Coast in 1976. He then joined local musician Rick Brown playing clubs from Alberta to Ontario before settling back down on the coast. Ken has been playing with Doug in various groups since 1996. Mark Evans was raised on the coast until leaving in 1976 for college. He returned in 2006 to retire. Mark has been engaged in Rock bands across the western provinces since high school. Mark plays drums, guitar and vocals. Bob Ewert was born in the summer of love! Somehow he managed to make it to 2016... the summer of world discontent. That said, he's still pretty groovy! After a 20 year musical hiatus, Bob has re-grooved, dusted off his guitar and now enjoys playing the local scene with Half Cut and the Slackers.